FFA - Graze Nature Delivered is a new top advertiser on Al Jazeera America. 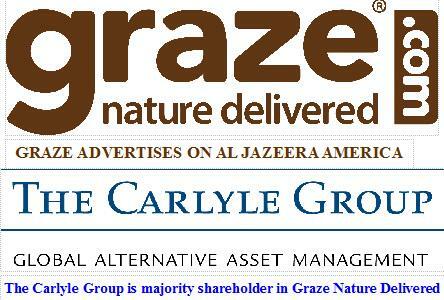 Graze Nature Delivered is a new top advertiser on Al Jazeera America. The Carlyle Group is the majority shareholder in Graze Nature Delivered. The email for this article was deactivated after Al Jazeera America closed. Graze Nature Delivered has frequently advertised on Al Jazeera America for several weeks. The Carlyle Group is the majority shareholder in Graze Nature Delivered. Florida Family Association tapes ten hours of programing on Al Jazeera America every day. The Florida Family Association office communicates with each advertiser no less than once per week. Graze Nature Delivered ads continued to air on Al Jazeera America after officials received several email communications from Florida Family Association. Al Jazeera, whose leaders espouse hate for Israel, who showed disdain for Paris murder victims, is a news company that is owned by the non-democratic, monarch styled emirate of Qatar who allows wealthy citizens to financially support ISIS, supports the Muslim Brotherhood, backs the head of Hamas, espouses Islamic Sharia law and does not afford citizens freedom of the press. There are many reasons why Corporate America should not spend United States' consumer dollars with Al Jazeera America. Click here to read more. The news media does influence the political positions of the public. The Islamist political positions held by Al Jazeera officials and/or owner, especially those positions demonstrated above, pose a threat to changing American public policy that has protected life, liberty and the pursuit of happiness. Graze Nature Delivered certainly has the right to choose where they use their advertising dollars. You have the same right to object and choose to patronize other companies that won't give your consumer dollars to Al Jazeera. Florida Family Association has prepared an email for you to send to urge Graze Nature Delivered officials. The majority shareholder The Carlyle Group is blocking emails from Floridafamily.org officials to stop advertising Graze on Al Jazeera America.